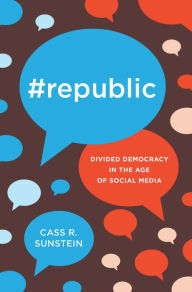 #Republic by Cass R. Sunstein breaks down our fragmented ways of consuming news and information, showing how it has lead to increased partisanship and decreased respect for those whose views may not be our own. Sunstein worked in both the Clinton and Obama administrations in different capacities but has his finger on the pulse of understanding how our consumption of information and news has become more partisan and increasingly crafted to our perceived views as time has progressed. He places a chunk of the blame for this at the feet of Facebook, for crafting newsfeeds around what it thinks is our views. The author is great at acknowledging the increasing divisions politically and socially but struggles to nail down strong arguments for how to fix it. He lists a myriad of options but does not settle on a list of ideas that he feels are most effective to counter our divisive world, nor does he challenge us as a society to rise above the curation and handcrafted newsfeed to seek out views that dissent with our own. He suggests some various options that Facebook and Twitter can try out but leaves little of the challenge at Americans themselves, who have largely grouped into various social media herds. #Republic is an effective read at understanding the current environment and listing a number of suggestions that Sunstein argues may start fixing it. Where he misses the mark is in not putting more onus on Americans to think critically and to seek views outside of their “herd” in helping shape their views, nor does he put more pressure on traditional media sources to adhere to a higher standard and avoid the sensationalism of BREAKING stories nonstop.